My computer crashed last week and I still haven’t gotten it back yet, but thanks to my wonderful sister-in-law I have use of a loaner. I had to reconstruct this boot cuff and rewrite the pattern because all my information was on the other computer. It has certainly been a task but finally got it completed! I worked this project using two different types of yarn. I enjoy using I Love this Yarn because it is soft and comes together nicely but wanted to try something new. I love the Cascade yarn too because it gives the cuff an even softer feel (because it is cotton) and is much thinner in comparison to the acrylic yarn. I like this because some of my boots have a snug fit and the cotton is a better fit. 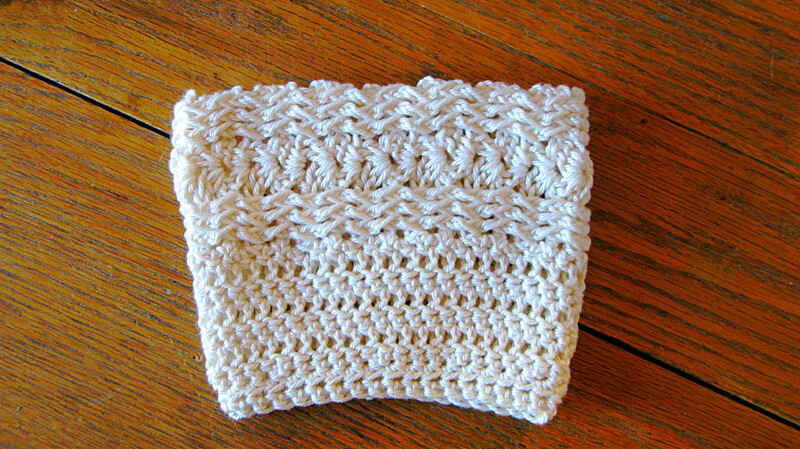 This the is cuff made from I Love this Yarn. This is the cuff made from the 100% Cascade Yarn. Cascade Ultra Pima – 100% pima cotton. The color I used was cream. Gauge: 8 stitches and 4 rows = approximately 2 inches. I was pleased with the width of the cuff, but did need to increase the number of rows worked in comparison to the acrylic cuff to fit my calf. sctog – Sc in next st, draw through only one loop (2 loops left on the hook), sc in next st and draw through remaining 3 loops. fpdc – YO, insert hook from front to back around the post of next st, YO and pull up a loop and complete as a dc. bpdc – YO, insert hook from back to front around the post of next st, YO and pull up a loop and complete as a dc. Turn pattern wrong side out and join ends together using the long tail and take the side just fastened off using the tapestry needle to sew through both loops of the stitch and the bottom loop of each stitch on the first row. Fasten off and weave in the ends. Turn pattern right side in before working the bottom part of the cuff. Row 1: Join to cuff by ch 1 and sc evenly around, sl st into first sc (not the ch 1). 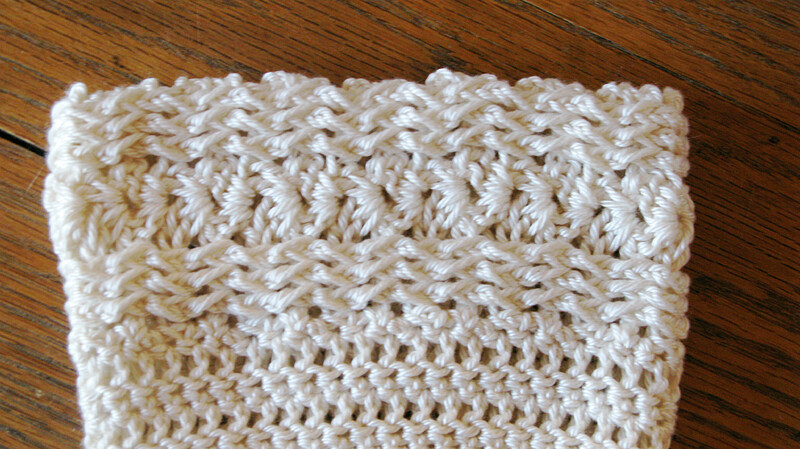 (Hint) You will later be decreasing stitches so be sure that your stitches will divide by 4 evenly then add two more sc. (Example: Sc 44 stitches plus 2=46 stitches around.) 46 will actually be a good number to use on the average size cuff. Row 2: ch 2, dc in next dc and around, Sl st in top of ch 2 st.
Row 3: ch 1 and sc in same sp, sc in next st and around, sl st in first sc. Row 4: ch 2, dc in next dc and around, Sl st in top of ch 2 st.
Row 5: ch 1 and sc in same sp, sc in next st and around, sl st in first sc. Row 6: ch 2, dc in next dc and around, Sl st in top of ch 2 st.
Row 7: ch 1 and sc in same space, sc in next 3 dc, *sctog in next sc, sc in next 3 dc, sctog in next dc*, repeat from * to * across, sl st in first sc. Row 8: ch 2 and hdc in next stitch and around, sl stitch in top of ch 2 st.
Row 9: ch 1 and sc in same sp, sc in next stitch and around, sl stitch in first sc. Fasten off and weave in ends. I just watched the video about making wavy fpdc and bpdc. I think that needs to be included with this pattern otherwise people will continue to not get the correct effect. I think you are right. I’ve been so busy that I had forgotten about this pattern and all the questions about getting the same look! Thanks for the reminder! I don’t think this is the pattern that goes with the boot cuff shown……. I think I figured out how you achieved the wavy pattern. When making the front or back post dc, instead of wrapping the yarn around the post, you start off putting it around the post and then pulling the loop through the top of the Y of the post. I can post pictures, but I got the same wavy pattern that way. The first time around I did it the correct way and the lines were just straight up and down. You are correct. Crochet your first round as normal and when you come to the second round, you will dc, ch 1, dc in the ch 1 space from the previous round. Let me know if you need any other help. I hope changing yarns helped. I’ll also say that I’m left-handed and crochet from back to front. It normally doesn’t cause a problem, but I’m almost thinking it does with the pattern. When I crochet the fpdc stitches, I do them “normal” as in front to back but then I do the bpdc stitches from back to front. I’m thinking this is causing a bias with the pattern. Let me know how it works out. I have crocheted one boot cuff so far and I am also not achieving the zig zag look on the top of the cuff that yours has and also getting the curling of the edges as some others have posted? Unsure what I could do differently to get the zig zag affect? I am beginning to believe this is due to me being left-handed and the way I crochet. Under normal circumstances, I crochet “backwards” meaning back to front. However, when I crochet fpdc and bpdc I crochet from front to back. When I wrote this pattern over a year ago, I didn’t think my way of crocheting and being left-handed would affect the pattern. I will update the pattern later this evening to give this as a possibility of not achieving the same results. I love the look of these & I’m anxious to try them. I’m a lefty; is this the left- or right-handed pattern posted here? For this pattern, it doesn’t matter if you are right or left-handed. There were just some questions about the waviness of the pattern, and I thought it might be related to being left-handed and crocheting backwards. You will be fine! Hi! I am left handed and was having the same problem with not getting the waves. I have straight lines. After reading through the comments and not getting any help, I carefully read the pattern. The problem we are all having with the waves is that instead of doing the fpdc or bpdc by hooking around the post of the NEXT stitch, we are hooking around the post of the stitch directly below it. This is likely what is also causing the curling on the edges. I am finishing the pair I began doing it the wrong way because I like the wrong result too lol. However I am going to crochet the pattern the right way next! Thank you for the pattern. Hat is the vs way I ensure it will fit the person you are making it for as a gift? What is the best way to make sure it will fit someone if you are giving these as gifts? I didn’t set a standard size for these cuffs as everyone’s body shape can be different. It’s so different from making a hat where everyone at different age groups relatively have a similar size. Yeah I got their parents to do that just wasn’t sure how the cuff would measure in relation to the measurement I was given! Thanks! I also think on the boot measurement that you have to consider whether the boots fit snugly or whether they are loose. If it’s a tight fit boot maybe only take away an inch if it’s a loose boot maybe 2 inches. I do NOT get the same “look” as yours, with the fpdc’s on right side & bpdc’s on the wrong side. Your fpdc’s & bpdc’s produce a zig-zagging (uphill, & downhill result, which I “wanted”, but can NOT obtain! Mine go “straight” up (“across” when turned to the left to wrap around the leg.) AND, mine ARE curling (at the sides, before adding the bottom, like another person said their’s were doing also. I can send pictures showing this. I’ve been crocheting since I was 7, so 56 yrs. I’m also a licensed, certified knit & crochet instructor through the craft yarn council, write my own patterns, & have won awards, so I don’t know “why” my work doesn’t look like yours. Please help. I’m sorry you are not getting your desired results. I picked up some yarn and started the pattern and after 10 or so rows was able to get the same results in my original photo. I looked on Ravelry to see if anyone else has worked up the pattern. There were a few projects in there that looked similar to mine. As far as the curling, maybe ensuring the ch 3 isn’t “too tight” on the turn or you could even add a row of sc to the top to make it more sturdy. You can send me pics, and I will certainly try to help you. My email is elkstudiocrochet@gmail.com. Hi Tammy, I was having the same problem. I resorted to going back to reading the pattern very carefully add I simply could not figure out why I was not getting the same results as pictured. And there it was right in the pattern! I can’t believe so many of us made the same mistake! We are all doing the fpdc & bpdc wrong! I believe we all are so accostumed to hooking around the stitch directly below that none of us read the pattern as carefully as we should have. When doing the fpdc our bpdc, hook around the NEXT stitch NOT the stitch BELOW it. Hope that helps. Im lost at this part..Turn pattern wrong side out and join ends together using the long tail and take the side just fastened off using the tapestry needle to sew through both loops of the stitch and the bottom loop of each stitch on the first row. Fasten off and weave in the ends. Turn pattern right side in before working the bottom part of the cuff. I get the beginning on joining the ends, its the rest I dont understand. It’s like taking a shirt and turning it inside out. You have a right side to the pattern and a wrong side. When you sew your ends together, make sure the “wrong side” is out, so that when you sew it together, you can turn it back to the “right” side and your seam will be nice and neat and then finish with the lower portion of the cuff. 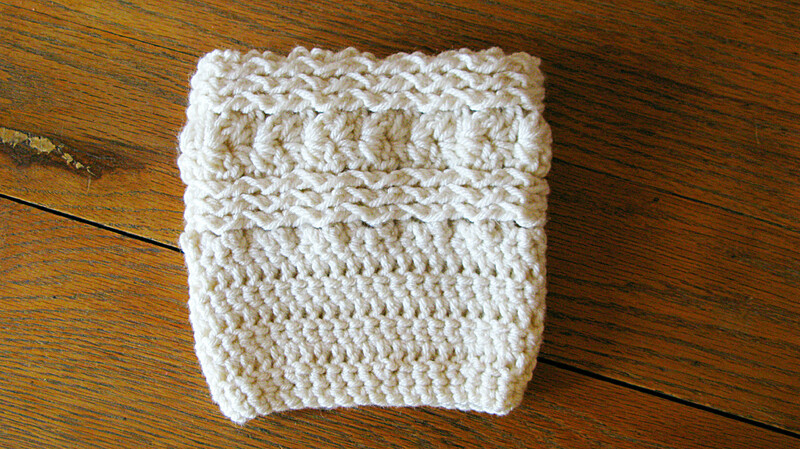 With the ends of the cuff together, insert the needle into both loops of the row just completed and then into the bottom portion of the first row of the cuff. If you still are having problem, let me know. How wonderful you are!! I make some sort of homemade “fashion” item for about 10 girls/ladies each year…..and this year it will be these. I was inspired by my neighbor who’s dad 🙂 made her a pair. But they were just a little plain for my my taste. So very excited about this pattern. Going to make a red Christmas pair for myself to wear to the theater on Saturday to see ‘A Christmas Carol’. If all goes well, this will be my official gift this year 🙂 You are so wonderful to share this with such a giving heart. Thank you!!!! Thank you for posting these for free. I am making sets for the teen girls for christmas! I’m using a slightly thicker yarn, and an H hook because I wanted them more “full”. I like the way they look, but the top and bottom seem to curl. Could that be because of my larger hook/yarn or does the top and bottom sections curl for everyone? I’ve not had anyone say anything about the cuffs curling, and I haven’t tried them with a bigger hook. It sounds like it may be too right. Maybe increase the number of your stitches on the second part of the cuff if you think it would help. This is a lovely pattern, thank you for sharing! I posted my finished product on my blog. I love your version of the cuffs! You did a spectacular job! Are these all crochet stitches or is some of this knit? I have been looking for a good pattern that doesn’t include knitting because I only know how to crochet. Thanks! All my projects are crochet. I’ve tried knitting but it doesn’t like me. What is a front one back “post”? I’m not sure I understand your question. Are you meaning fpdc? Hi- I couldn’t figure out what a “post” was – but I got it figured out and have since made these cuffs and they are beautiful! I will make 2 more pair to give to my daughters and my daughter in law for Christmas. Thanks so much for this beautiful pattern! I’m glad you were able to finally get it! I would love to see some pictures! Thanks J.G. I think that people who work hard to make a product should be able to profit from it! I love seeing people share their finished product with me! Thanks for sharing this, it looks beautiful! Thank you! I think it is my favorite pattern so far. I love the way it turned out with the cotton yarn! Glad you took the time to comment! Have a blessed night! Thanks for sharing! I love your cuffs! Gorgeous!